KITsubs: Kamen Rider Episode 07! I hate to leave you all hanging for the end of this story! The infamous Nazi Gold (note: gold not included) saga ends with this episode! The episode also features one of the best Rider entrances ever. I challenge you to find a better one! Pay attention towards the end... Also in this episode; Tachibana gets his moment to shine, and gets pretty tough in the face of danger! Starting next week, I'll be re-uploading all of our episodes (with some v2 scripts) to Multiupload, for people who can't use Megaupload and Rapidshare. I'm still working on putting a torrent together. Maybe when we have 10 episodes,we'll make a batch torrent. I have to figure out how to do it before then. I hope you're all enjoying the show, so far. We're nearing a pretty big milestone, coming up soon. The first appearance of Rider 2, and the beginning of the franchise-long trend of Double Rider Justice! But next time, the debut of Shocker's BeeWoman. Check the blog, and our twitter, for updates! Also, please remember to pass along the word about the Super Hero Time donation boxes, on this site and many others. Reports are saying that relief donations are coming very slowly for Japan, and every bit counts. Also, a shout-out to our friend at Tokyo Hipster, for the awesome fund-raising wrist bands they're putting together for Super Hero Time. It's way to show your support, and it's unique to the Tokusatsu community. Check it out! That was quick. Thank you so much! These are awesome! What torrent client do you use? I might be able help you out. Thanks! I watched all 7 episodes and really enjoyed them. In fact, I enjoyed them more then OOO, W and Decade. 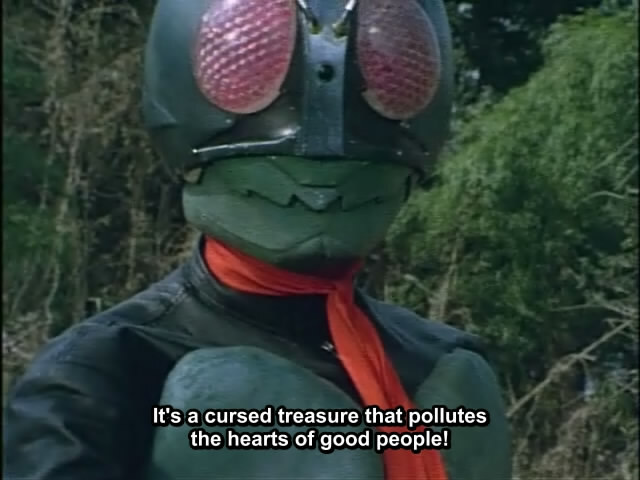 Part of the enjoyment comes from the fact that this show yet lacks the Kamen Rider conventions that we are use to seeing. The other part of my enjoyment is finally seeing a real masculine rider. He's not wearing woman's clothes, has a feminine haircut or acting wimpy. He's a man, a proud one, a strong one. Yeah! I agree with you HHB! Also for me, Takeshi Hongo is hotter than those pretty boy types. Hello! I am trying to download this episode, but all the links seem to be dead ends. May you please link me and everyone else interested to a working link...?